From past experience I knew that the answer was to be found in the layoutEx property of the VirtualMachine object. The layoutEx property, that came with API 4.0, contains a wealth of information concerning the virtual disks connected to your guests. Since you can find back the mapping to all individual files that constitute a virtual disk, it is the ideal property to show the actual storage used by each virtual disk and the snapshots. The following graphic shows how the three major properties in the VirtualMachineFileLayoutEx object are organised. The values in the graphic are from a virtual machine, with one virtual hard disk, and two snapshots. I assume that most of you know what happens in the background with a virtual disk when you take a snapshot of a virtual machine. The following graphic is small aide-mémoire for understanding the basics. If you look closely at the Snapshot table (first graphic) you will notice that an entry points to the files, or chain of files, before the snapshot was taken. For example, Snapshot 2 results in the FileKey sequence 0, 1, 2 and 3. While the actual new files that are created for Snapshot 2, are those with FileKey 4 and 5. Since I wanted to know how much datastore space Snapshot 2 was taking, I decided to let the script look for the files linked to Snapshot 2. In this case that would be the files with FileKey 4 and 5. For all guests determine the number of snapshots, if any, they have and take the maximum of these numbers. Define a new object, I called it DiskInfo in the script, and define a sufficient number of snapshot-related properties (Name and Size) so that the guest with the highest number of snapshots can be represented. Define the new object in C# and use the Add-Type cmdlet to create the new type. Like I mentioned earlier, I wanted to display the actual datastore space a specific snapshot takes. For that I had to find the FileKey values that are not in the Snapshot table. My reasoning for this was that I wanted to know how much datastore space would become free when a specific snapshot is removed. Line 1-11: The “static” part of the C# code that defines the DiskInfo type. Line 13: Get all the virtual machines. I used the Get-View cmdlet for speed and also because the script only needs properties from the VirtualMachine object. Line 14: Determine the highest number of snapshot present on any guest. Line 19: The “newline” character is not really. Just gives a better view when you dump the content of the $DiskInfoDef variable. Line 21: The new type is created. Note that when you change anything in the definition, you will most probably have to restart your PS environment, otherwise you will get a message that the type already exists. There is, afaik, no way to get rid of a type definition in the .Net environment. Line 23-30: This filter will recursively run through the snapshot tree and will create a hash table. The table will later be used to find the snapshot name. Line 32-98: The main loop. Line 35-37: Create a hash table from the snapshot tree. Line 39: Loop through all the virtual disks connected to this virtual machine. Line 46: Get the name of the first disk file. Line 48-50: Summarise the size of each file that comprises the virtual hard disk. Line 52-55: Check if the virtual hard disk is Thin Provisioned. If it is, calculate the percentage of storage that is actually allocated on the datastore. Line 57: Create a new object based on the DiskInfo type. Line 58-65: Start filling in the values for the properties of the DiskInfo object. Line 66-94: Handle the snapshots (if present) for this virtual hard disk. Line 67: Start by checking if there is at least one snapshot for this virtual hard disk. Line 68: Loop through all the snapshots. Line 69-71: Get the FileKey for all the files for this virtual hard disk before the snapshot was taken. Store these FileKey values in the $prevFiles array. Line 72-78: Find the first pair of FileKeys in the chain that is not in the $prevFiles array. These are the files that constitute the snapshot. Line 79: Store the pair of FileKeys in the array $snapFiles. Line 82-89: Calculate the total size of the snapshot files and get the name of the snapshot from the hash table created in the beginning of the main loop. Line 90-91: Store the values in the correct properties in the DiskInfo object. Line 97: Export the array to a CSV file. The following screenshot shows a sample run of the script. There are some interesting results in this sample run. The maximum snapshots any guest has is two. Server1 (row 2-5) has three virtual hard disks. The first one is thin provisioned and uses currently 47.7% of it’s capacity. The other two hard disks of Server1 are RDM disks. Notice that the AllocatedMB column says “zero” because there is not really a point in talking about allocated space for RDM disks. The guest in row 8 has two snapshots. And last but not least, I suspect there is a bug in the VirtualMachineFileLayoutEx object, more specifically in the Size property of some entries in the Files array. Have a look at row 20, this disk is not a thin provisioned disk but the AllocatedMB value is less then the CapacityMB value. I would have expected the same value in those two columns. When I investigate from the console with a simple “ls -l” I see the correct value. For one reason or another, there are some (very few) virtual disks that have an incorrect size values in the Files table. I couldn’t find out in which cases this seems to happen. This change countes in my environment the file sizes correct. props for using “aide-mémoire” properly in a technical article! It looks like there is a curly bracket missing at the end of this section – i have added it below. Hey LucD, Thanks for the script. I am new to powerCLI, ran ur script, it generates a CSV, however there was empty..Please help, Thanks in advnce..
@Westsider, the script will only work when you are at least on vSphere 4.x. Did you get any error messages ? Where 40,960.00 is not the log size, it is the size of the VMDK file. 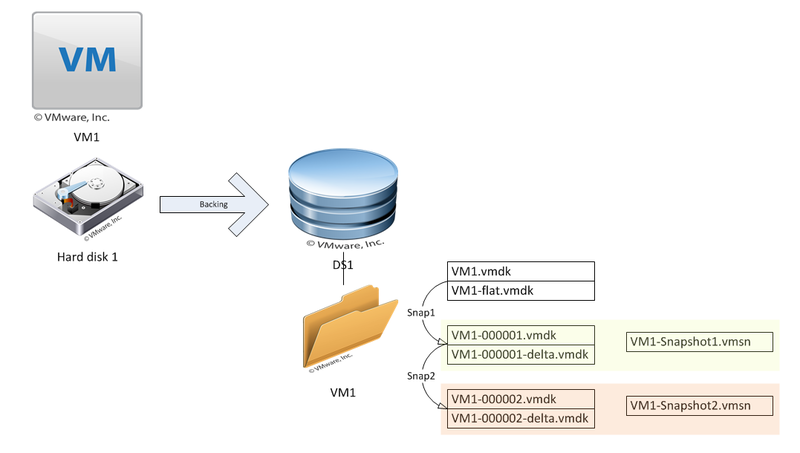 Looking at the datastore itself, there is only 1 VMDK (40,960.00) and 1 vmware-2.log file (a few kb, certainly not 40GB). when I run this script it returns this error? Add-Type : Cannot add type. The type name ‘DiskInfo’ already exists. @SAL, that is a problem with the object types you add with the Add-Type cmdlet. These types can not be removed nor renamed. There are 2 solutions, you stop/start your PowerShell session, or you add a random number to the typename. That last option is the one I took in LUN report – datastore, RDM and node visibility. Hi LucD, Many thanks for a great site! I’m new to PowerCLI but is possible to also report on the space used even if the disk is thick provisioned (rather than na)? This would show the potential disk savings you couls get by converting to thin provisioned. (I realise that this script is a couple of years old now but assume it hasn’t been superseded by something better)? Hello — Ran script yesterday no problem. Today, it only shows max. of one snapshot on any VM although I have several with 2. I added 2 snapshots to another VM and it reports it properly, but still only reports one on the others. makes more sense as it will not get templates. If you have any template in the collection you get an error as mentioned in some comments here. Thanks Robert. That is a great tip. Is there a way to get snapshot info for VMs that are experiencing snapshot problems, i.e. Broken child parent CID or snapshots not showing up in SnapShot Manager? @MikeP, I’m afraid not. The script uses the Snapshot property in the VirtualMachine object to find the snapshots. If the chain of snapshots is not correct, the script will not show these broken snapshots. I suspect you will have to have a look at the headers of some of the .vmdk files to retrieve “broken” snapshots. Any idea about what the problem is here ? @Simon, could it be that you run the script against a pre-ESX(i) 4.x server ? I am trying to use your script to return the guest.disk.diskpath and it keeps coming up empty. I defined “public string Drive” in the Diskinfo and added $diskinfo.Drive = $vm.Guest.Disk.DiskInfo and it did not work. I should note that the machine I am testing on has multiple drives. @Steve. The yadr script looks at the virtual disks as they are seen by the ESX(i) host for a specific guest. The DiskPath you mention is the path to the partition defined inside the OS running in the guest. This information is provided through the VMware Tools but there is no link to the virtual disks. To make that link the script would need to find a method to link these OS partitions to virtual disks. That is currently not possible with the PowerCLI cmdlets nor by any of the SDK methods. Arnim did an excellent write-up on this in his PowerCLI: Match VM and Windows harddisks – Part 2 post. After see this amazing script I immediatly try it and worked pretty fine but I am in a need to only use the part where you do the RDM analysis and merge it with my script I am trying to do it but I have been failing could you give me a hand with this buddy? @Paulo. Thanks. I’ll have a look how we can incorporate the RDM part in your script. there is no errormessage/output on the console and the script finishes in about 10 sec. I have a Problem with your script. When i run it i get no output. the csv file is created but empty. Any obvius reason why this could happen? @MasterPi How did you run the script ? From the PowerCLI prompt ? Any error messages ? Does ‘Get-View -ViewType VirtualMachine’ return anything ? @LucD anyway no issues, let me try installing PS2.0 and try again. Hi LucD, now i’m using on vSphere network. i’m getting the below error. @Sathya, that indicates you’re using PowerShell v1. The Add-Type cmdlet, which is essential for this script, requires PowerShell v2. Sorry, should have been indicated in the post. @LucD u r right. i’m running this script against ESX 3.5 Hosts. Hi LucD, i’m having hard time to run this script, getting the below error. @Sathya, I suspect you’re running this against ESX 3.x servers ? Hi Luc, I´ve encountered an error if the vCenter Installation is localized (i. e. German), so the Hard disk gets back as Festplatte. There is an easy change to run the script in any localized VMware environment, I wanna share. Thanks Dennis. This is a very useful tip. This is a fantastic YADR!! Trying to decipher the data to see how much disk is actually saved via thin disk ..
or figure out what the over-allocated value is. — more interesting would be to trend this as a rate to calculate how much disk usage is happening even under thin provisioning.. Thanks, glad you like it. And that you could put it to good use. I’ll check how this can be done and I’ll amend the posts accordingly. I had some templates that had not been labeled as VMs since moving to vSphere. Their "provisioned" and "used" values in VIC were n/a. converting to VMs filled in these values and switching them back to templates kept the values, no more script errors. I'm sure there's a quick error check you could do for null values coming in. I just thought I would pass back this info. Do you still have one of those templates ? It would be interesting to know if $vm.LayoutEx was equal to $null or if $vm.LayoutEx.File was equal to $null. Do you have this script that I can download complete? I did a copy/past and have lots of errors. I might be doing something very simple…. just not sure what is wrong. When you hover over the box that contains the script, there should appear 4 icons in the top-right of the box. The 2nd icon copies the script. regarding line #20: The other way is dangerous! If you have a vmdk that sais 10GB and a flat-file with 20GB in size, it will work fine – as long as you don’t do svmotion or sometimes snapshots. Would you happen to know what could cause these discrepancies ?